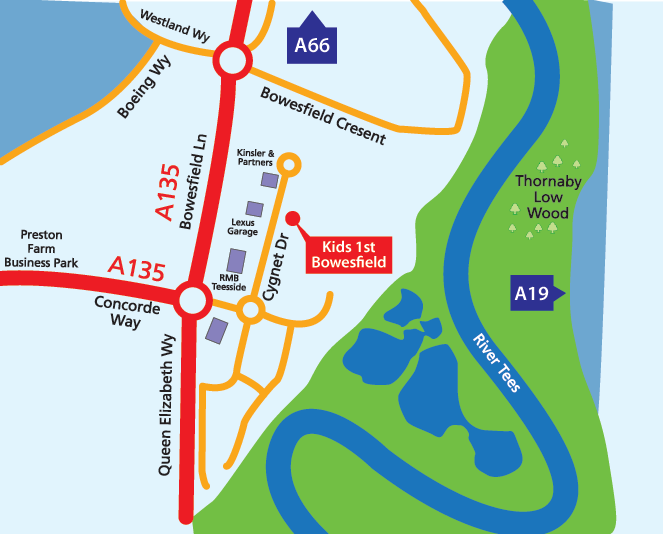 Kids 1st Bowesfield is situated just off Bowesfield Lane, a short distance from the A66. The new purpose-built nursery has 108 places and has been designed to provide a wonderful child-friendly environment. The nursery is split into rooms depending on age group and stage of development. Each room has direct access to large, well-equipped and challenging gardens which have been designed to suit the age groups that use them. In April 2015, Kids 1st Bowesfield achieved an outstanding Ofsted report and was also named one of the Top 10 recommended nurseries in the North East by daynurseries.co.uk. As an extra addition to the curriculum, children at Kids 1st Bowesfield will be able to participate in music and movement lessons, and will be taken out on visits throughout the year. We love to involve our parents through regular parents’ social evenings and play days; at these events you will meet with your child’s key person who will talk to you about your child’s development.